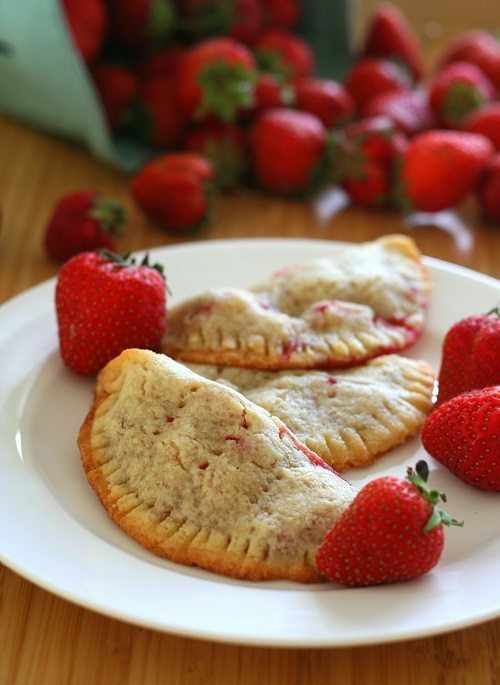 Fresh strawberries in a tender almond flour pastry crust. Low carb, gluten-free hand pies! Again, I have nothing against eggs in general. In fact, I love them and eat them almost daily in some form or another. But eggs don’t belong in a true pastry crust. Sorry, eggs, you are delicious, but you have a tendency to make the crust very heavy and decidedly un-flaky. Eggs or egg whites may help hold the crust together, but it will be much more leaden in texture. It definitely won’t have that melt-in-your-mouth tenderness. In the absence of gluten and eggs, I knew I needed some help getting the almond flour to hold together. I would love to have an all almond flour crust, but I tried that a few times and the results weren’t pretty. So I went with a little teeny weeny bit of starch, in the form of some gluten-free all purpose flour. I used as little as I could get away with, so as not to raise the carb count too much. I was very pleased with the results. The dough is still quite fragile and has to be handled with care. But one great thing about the absence of gluten is that the dough patches back together really easily and can be re-rolled without the loss of too much tenderness. 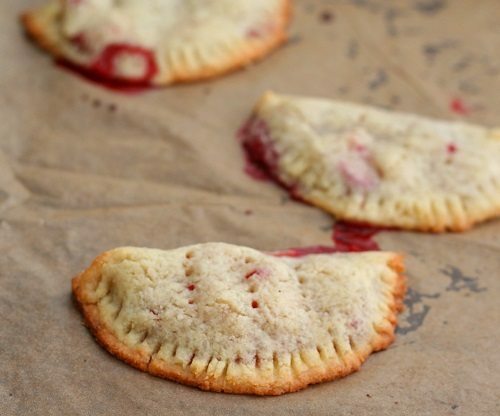 It worked so well for these hand pies, because the circles of pastry were small and easy to work with. I also made a few of them into tarts and was impressed with how well the dough baked up, without getting too soggy on the bottom. And I have also tried it out as one large pre-baked crust (for a coconut cream pie, and I will post that recipe in a few days). Because it’s so fragile, it’s tricky getting it into the pie pan without a lot of cracks and tears, but again, it patches back together so nicely. I have a few ideas of how to strengthen it without losing the tenderness, so I think there may still be some tweaking to be done. And I haven’t yet tried it as a top crust for a large pie, so I can’t quite say how it will perform there. But for now, I am extremely pleased to have a delicious low carb almond flour pastry crust. I have so many recipe ideas for this crust, I hardly know where to begin! Fresh strawberries in a tender almond flour crust. 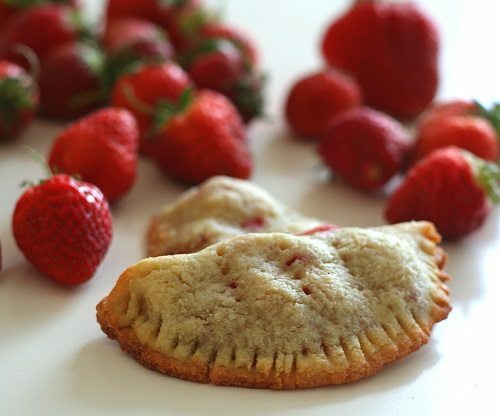 Low carb, gluten-free strawberry hand pies. Preheat oven to 350F and line a large baking sheet with parchment paper. For the filling, combine chopped berries and erythritol in a small bowl and let sit. For the crust, combine almond flour, all purpose, erythritol, guar gum and salt in the bowl of a food processor. Pulse to combine. Sprinkle butter over and pulse until mixture resembles coarse crumbs. With processor running on low, add ice water 1 tbsp at a time until dough begins to clump together. Cover work surface with a large sheet of parchment paper and sprinkle with almond flour. Turn out dough and form into a disk. Sprinkle with additional almond flour and top with another piece of parchment, then carefully roll out in all directions to form a 10 inch circle. Remove top parchment and use a large circular cookie cutter, about 2 3/4 inches in diameter, to cut out as many circles as possible. Gently lift circles with a knife or offset spatula and transfer to prepared baking sheet. Re-roll scraps to get as many pastry circles as possible. You should be able to get 9 or 10. Avoiding any juices collected at the bottom, spoon a small amount of berries onto one half of each circle, leaving 1/2 inch edge for sealing. Gently fold the other half of the pastry over and seal edges. Use a fork to crimp. 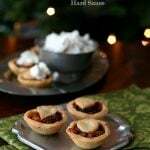 Use a sharp knife to cut small slices into the top of each hand pie to release steam. Bake 16 to 18 minutes or until pastry is light golden brown. Let cool completely on pan before serving. Serves 9. Each serving has 6.7 g of carbs and 2 g of fiber. Total NET CARBS = 4.7 g.
One word…quiche. Thanks for this recipe! 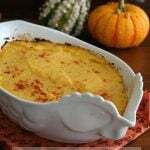 thanks for this recipe Carol! I read somewhere that you could also chill the flours that you are using along with the chilled butter. Sounds logical to me. I think I’ll give this a try once I find the Bob’s Red Mill product that you used. It shouldn’t be too hard to find. Most gluten-free sections carry Bob’s Red Mill GF flour. I found it at my local ShopRite today. If I do not have a gluten intolerance, would Gluten Flour work just as well? I’m picking free raspberries Friday morning. Do you think I could make this with raspberries instead of strawberries? Yup, I do! just cut them up a bit so they are smaller and you can fold the dough around them. also, does the gluten free baking mix affect your blood sugar? I would say, Yes, Mercy. Bob’s GF flour contains, among other things, potato starch and tapioca flour. Per Dr. William Davis of “Wheat Belly” fame, products labeled “gluten-free” shouldn’t be consumed by anyone because of their effect on blood sugar. I will disagree, Sharon, at least in the degree that it is only 1/4 cup of the flour and adds only 2 g of carbs per serving. The total number of carbs I stated in the recipe is correct. Almond flour and coconut flour are labeled as gluten-free as well, do you avoid them? The statement you gave from Dr. Davis in your comment is erroneous if the total carbs don’t amount to much. 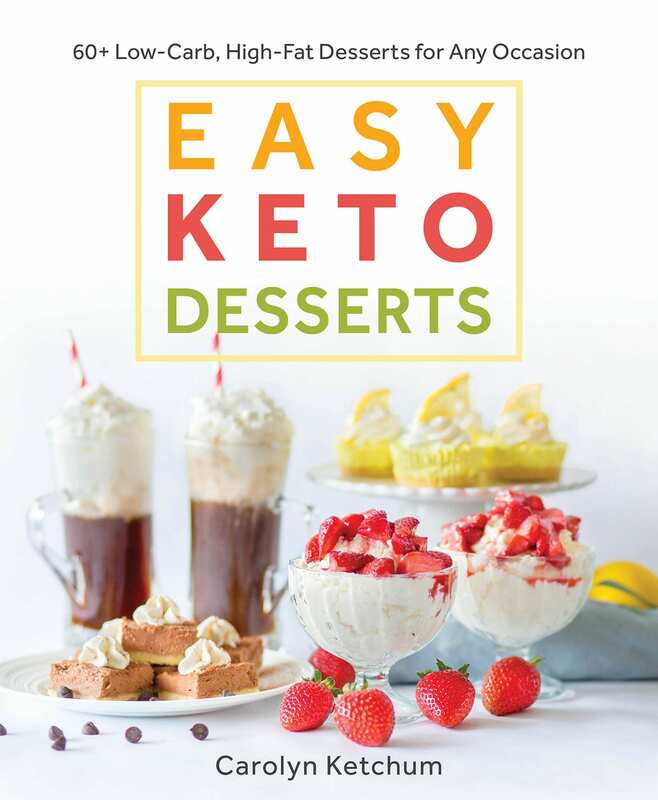 I actually test my blood sugar and these pies did not raise it (assuming you stick to one serving…which is the case for almost anything low carb). If you choose to not eat grains and such, that’s up to you. Dr. Davis may recommend it and I certainly don’t eat a lot of them myself, but they are useful in minimal amounts in baking. But to say this recipe would raise blood sugar? Not true. Thanks for your feedback! Thanks for your quick reply, Carolyn. Luckily, I don’t have to check my blood sugar (although I probably should; could possibly be insulin resistant). I do use almond flour and coconut flour as replacements for wheat and “carb-y” flours, although their use is not foolproof. I also use ground flax seed! It seems that everything that’s GF gets labeled (which is a good thing! ), but I do avoid multiple-ingredient products so labeled, because of those flours. (Generally, I like to use single ingredients, and not premixed). GF flour mixes may be OK in small amounts (such as your recipe), as long as serving recommendations are observed, but I’m still concerned about the effects over time. As for the egg-free issue, have you tried chia or flax eggs? These look awesome! 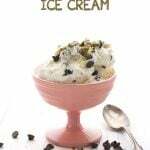 I’m going to make them this weekend to go with our raw milk ice cream. Thanks for the inspiration! Oh Carolyn, I have a ladies night this weekend, and these look perfect. I’m excited. I just did some crawfish pies similarly not long ago. We call ’em fried pies here in Texas, even if they are baked. 🙂 These look delicious, Carolyn. I’ll be trying them one of these days. Yay, it’s not just me! When I saw the pic, I said ‘FRIED PIES!’ like my grandma use to make. RIH. Wow I so love this site!! 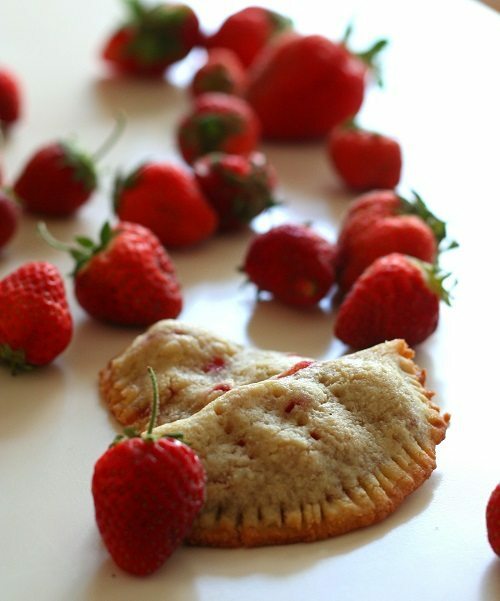 Love these hand pies… So summery and delish! 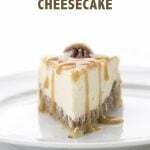 You really are the queen of low carb and gluten free baking Carolyn! I’m constantly astounded by what you can accomplish! I would not have thought this possible, but they look amazing! Chicken pot pie – here I come!!! 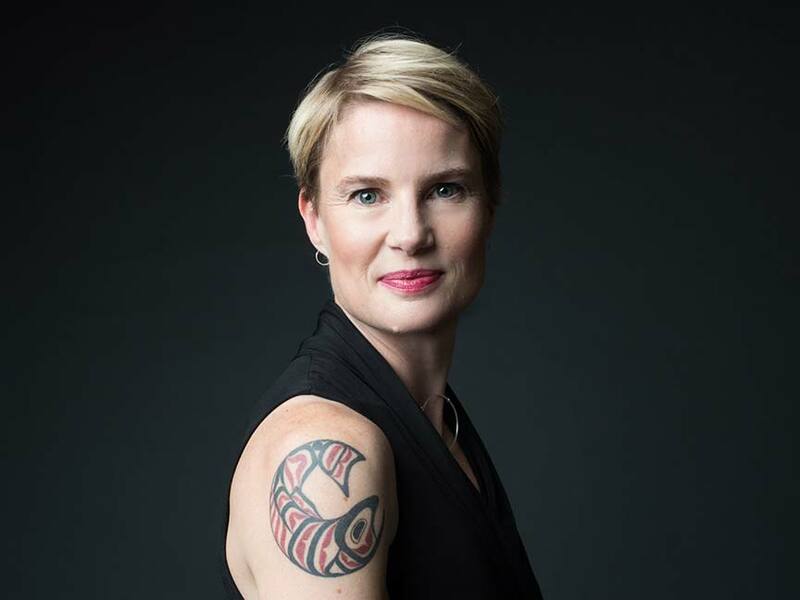 Excellent job, Carolyn! 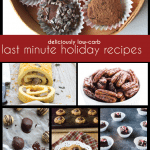 Mastering pastry for low carb or paleo lifestyles is definitely a challenge. I was able to do it, but I use my own blend of almond flour and straight starch and protein flours not in a ready made blend. Glad just 1/4 cup of Bob’s GF AP flour worked for you! 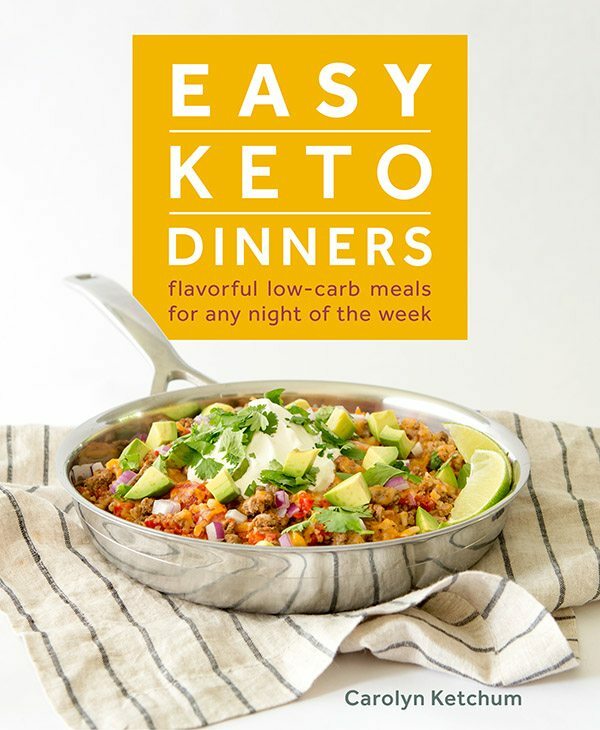 You did a fab job keeping the carb count down per serving! BRAVO! This doesn’t have strawberry jam, it has strawberries, fresh. I am sure you could put some cream cheese and powdered sugar in the center as well. Oh my, oh my…I must make. About how big is one pie? They were definitely on the small side, about 3 inches in width. But worth it! I wonder how many of these beauties I could safely eat for breakfast…. 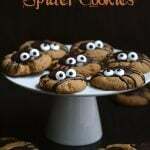 These look fantastic Carolyn! 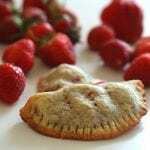 I love hand pies, and strawberry is by far the best!! YUMMY! Carolyn Are these really fragile? I have some in the oven. Here is a tip you may have already given it. Roll your dough between 2 peices of plastic wrap then take off the top , then flip the plastic wrap and dough into pie shell peel off plastic wrap and bake. I do this when I make the pockets pies also. Pretty fragile, yes. I tried the flip thing for the big crust and it still tore a bit. I am working on perfecting that! I wonder if silicone sheets might work for the rolling and flipping? I use wax paper or parchment paper, which works really well, when I roll out pie crust. These look amazing! Are these too fragile to be made into toaster pastries? Not sure. Do you mean you’d actually want to cook them in a stand up toaster? Then yes. But if you mean a toaster oven, they might do alright, but the strawberry juice would leak out a lot. Probably pretty messy. I made these last night and was pretty pleased with the results. My husband ate one and said “You didn’t tell me you were making pop tarts! These are GOOD! Can I have a few more?” I guess I used a smaller circle cookie cutter because I got 15 mini pies out of the recipe. This one is definitely a keeper!! Oh yay! Sometimes I don’t know if my recipes will work for other people, and especially something as tricky as pastry crust. 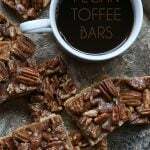 I know how to work with my ingredients but it’s hard to relay all of the info, no matter how carefully I write up the recipe. So glad they turned out! I finally found someone who has made these. These are incredibly “fragile”. I am an experienced cook and I had huge issues with making these. Please do not use 2-3/4 inch circles the math is off, if you want to leave a 1/2 inch around to turn the finicky dough, you need at least 3-1/4 inch circles. Also the filling should be really really small chopped up pieces of strawberry, because any pressure on the dough and it will puncture a hole. Also please strain the fruit from the juices by positioning a strainer over a cup or bowl to get rid of the juices. I have made pies for years with spinach fillings and leftover spaghetti meat sauce so I am used to playing with this size of dough…..and even they were finicky with high carb dough. I made about 4 then switched to just making tartlets with the rest as the method was more friendly and less stressful whew!!! The taste was very good, but too much dough for me in proportion to filling. The texture of “pastry” was spot on! Just wanted to provide some help to inexperienced cooks! Like Joanne, I made 4 and gave up. But instead of folding the diminutive circle in half, I topped it with another circle. The dough is extremely difficult to work with so I kept putting it on the freezer for a few minutes and work a couple of rounds, back in the freezer, etc. The rest of the dough I made a 5 inch “pie” using half the dough for the bottom and the rest for the top. The taste and texture was perfect. Note: my filling was Granny Smith chopped tiny, with Swerve, cinnamon and toasted pecans also chopped fine. I was thinking that your crust recipe might work for toaster pastries. But one would have to use a thin layer of jam instead of fresh fruit…..a winter project possibly! 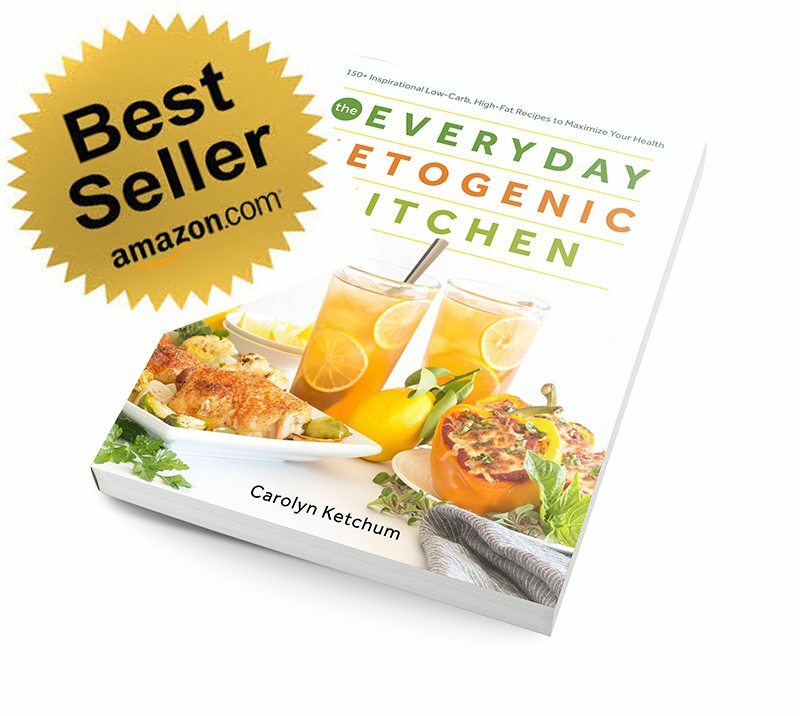 Anyway, thanks so much for this and all of your great recipes! protein strands… were you considering adding whey protein? No, whey protein tends to make things cakey. But gluten is a protein so it creates strands that help bind pastry crust and make it less fragile. I have a hard time following recipes exactly too…even my own! These are good the second day but I wouldn’t keep them around any longer than that. Mom used to make these. They were made with fresh pears, fried and dipped in sugar They were called pear tarts. An old Southern treat. Thanks for this. How many calories are in each small pie? Looks fabulous, but I always count my calories as well. This recipe makes a wonderful crust with a nice texture–the only problem is how brown it gets in the oven! Any tips for avoiding this? I would love to try a double crust pie but I’m afraid the toasted flavor will be too overwhelming. Thanks! Mine didn’t get that brown at all. Maybe try shortening your baking time by 3 or 4 minutes (your oven may run hot) and/or tenting with foil for the last little bit of baking. Could coconut flour be substituted for the GF flour? Wow! So, I showed my almost 4 yr old my Pinterest board of low carb treats and asked her what she wanted to help me make today. She picked these since she saw strawberries in the puc and we had gone strawberry picking this weekend. I’ve made a handful of GF, LC treats since starting my new way of eating a month or so ago but yowzers, this was my first pastry crust type dessert. I do not have a food processor so I attempted to use my Vitamix and then my Kitchenaid mixer when I didn’t think the dough was quite right. It was fragile for sure. I lost a bit of dough between machines so I only made 6. They look horrible, lol! I am going to post them on my blog in a minute in case you want to see. But, yum! The flavor is good and the crust is very nice! Thank you! Yikes! Oh well, as long as they taste good. Next time, just take two knifes or a pastry cutter and cut the butter up in the dough as finely as you can. I tried this crust recipe, I forgot to add the xanthan but it held together nicely and was so light and flakey. I used it for a quiche, so I baked it for ten minutes before pouring my egg mixture in to bake for another 25 minutes. It is excellent. I look forward to making these pies next. I don’t have GF flour and really don’t want to have to buy any. Could I use regular all-purpose flour and maybe leave out the xanthan gum? How much do you think it would change the amount of carbs in each serving? A 1/4 cup of flour has about 28 g of carbs. Divide that by 7 or 8 servings. So at least 3 more grams per serving, I would say. Do you think if I didn’t put the sweetener in the crust I could use it for samosas? Possibly! But do you intend to fry them like samosas? Not sure that they would hold together. No, I liked the idea of baking them. If I did want to try to fry them, I would probably try freezing one first to see if it would hold up. I noticed your pastry on the apple caramelized onion tartlets has less sweetener, do you think that one would be better to try making samosas? Hello! 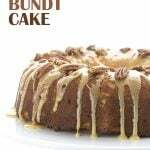 I am so very eager to try this recipe, but is there any way I could swap out the GF flour for coconut flour? My family and I eat on the Ketogenic Diet and the GF all-purpose flour is a way too high in the carb count. You need some sort of starch to get the pastry to hold together. I now typically use 2 tbsp coconut flour and 2 tbsp arrowroot starch in place of the GF flour. Do you think Carbalose flour would work in these or would it be to heavy? 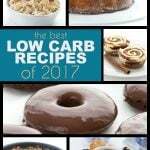 I also have another low carb all purpose flour, but haven’t been pleased with the results. I really don’t know, I haven’t tested it. I don’t like carbalose very much. Just made these little cuties. Used blueberries. Exactly 3 blueberries fit I to each pie, and as I was making them I was wondering “how good can these be with 3 berries inside”? Well they are excellent….so good. Warm blueberry pie right out of the oven. To. Die. For. I ate 6. Real problem here. But my recipe made 15 pies and I have 1/3 of the filling left over. Thank you again Carolyn- over the top this time. Hey Carolyn, I’m taking time out of our July Fourth festivities to tell you how awesome this crust is and to thank you again for coming up with it. Have you seen those cute berry pies with the stars over the blueberry portion and stripes over the raspberry portion? I thought I’d use your crust recipe to make a lower carb version of that pie. 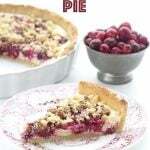 I used a bit of glucomanan and xantham in the berries to firm up the filling and I doubled your crust recipe and cut stars and stripes out of the crust for the top of the pie. 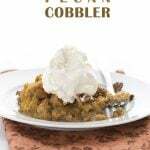 It tasted exactly like delicious, high carb pie crust and held together beautifully. Thank you! My entire family, with all their different health issue, loved it! This is a brilliant recipe. What a wonderful idea! Did you happen to get any photos? I would LOVE to share it. I did take one quick photo on my phone. It’s not the prettiest pie (I was in a rush and some of the raspberry juice seeped out on the sides and I didn’t take the time to clean it up and the waves on my stripes were off) but I could email it to you. I definitely plan on doing it again and taking my time and making it pretty. Either way, it was quite delicious and the crust was spectacular. Two days later, the tiny bit we have left is still great and the crust isn’t soggy a bit. Honestly, all my family agreed it was an amazing crust. If you make it again, feel free to send some photos my way! I’m so glad I saw Melanie’s comment about using this dough in a pie. I recently was inspired by my daughter who made a beautiful berry and ricotta galette using a recipe from smittenkitchen.com. I kept wondering if there was a dough I might use instead of the full wheat flour in that recipe. Seeing Melanie had some success, I gave it a try and it worked pretty well and looked rustically beautiful! I also doubled the recipe and added xantham gum to the fruit filling. I kept it on the same parchment from rolling to baking and the paper was it’s support through all the folding and manipulating when it came time to fold up the sides. Started to crack a bit near the end of baking time, but it tastes wonderful! Finally I can eat pie AND the crust again! 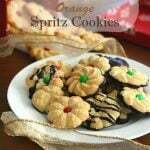 I want to make these for my father’s bday with mincemeat. Can you sub the sweetener in this recipe for the dough and use regular sugar or date sugar instead and it work out? I have never used these sweetners before and prefer more natural ones. Thanks! I am sure it would work. Is the sweetener in the dough a crucial element for this dough’s structure? No, I don’t think the sweetener is critical to the outcome so you can leave it out. Dough is definitely fragile! Not sure how it would stand up to freezing and then baking. I’m not gluten free and I just wondered if anyone has tried making a regular pastry recipe with vital wheat gluten flour? I’d love to know before I try it. Hello, Carolyn! I LOVE your recipes and truly appreciate all the work that goes into every one of them! Thank you very much. I have a question about a possible substitute with this recipe: Can I substitute coconut flour for the 1/4 cup Gluten-Free All Purpose Flour? I am wondering if this swap would hinder the texture of the crust? I appreciate your attention to this inquiry. God bless! You should be able to but the dough isn’t quite as sturdy or flexible. Use only 2 tbsp coconut flour.